STAGE 1 – First I read the script and try and break it down and decide the best way to depict the action. Then I rough out a quick thumbnail sketch of how I want the page to look. I try to envision the entire page to look because the eye immediately sees the entire page, sort of like how you see the forest before you see the individual trees. So, I want the layout of the ‘forest’ to be interesting before the reader starts to focus in on the details of every ‘leaf’. What I also try to do at this stage is to break down the action and determine what needs to be seen and what the important aspects of the script are and how best to tell the story. In this case, since the punchline was about ‘curiosity’ I wanted to emphasize the thought process of Mr. Precious as his curiosity is being piqued and he decides what he’s going to do. STAGE 2 – The next stage is to tighten it up a but further and to start thinking about how the two scientists will look as well as playing around with the text in the title. 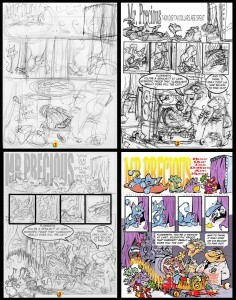 STAGE 3 – More details are added as the scientist characters take shape, and the pencil art gets ready to be inked and colored. 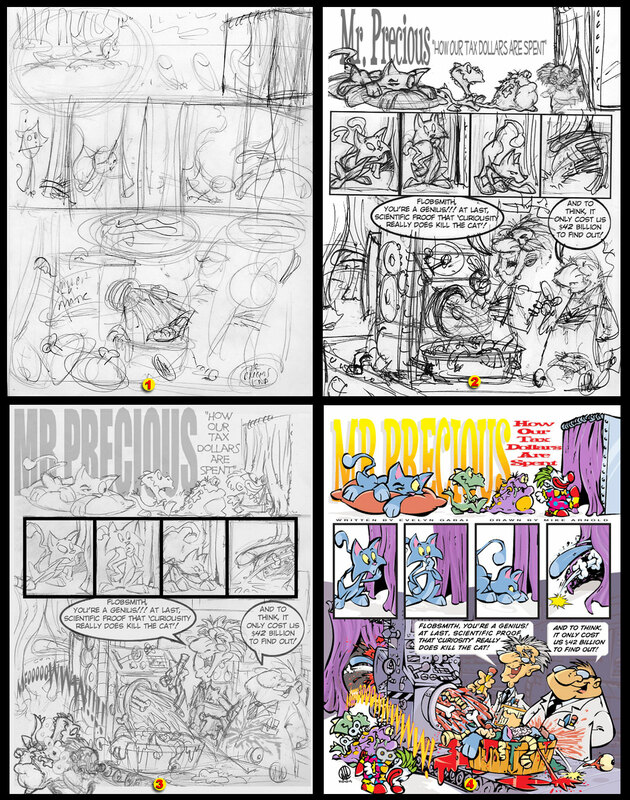 STAGE 4 – The final art is inked, then scanned into the computer and digitally colored. This entry was posted in Gag Cartoons & Comic Strips and tagged cartoon cat, cartoon scientist, comic strip, CRACKED Magazine, Mr. Precious. Bookmark the permalink.